The cell. 4. The nucleus. Atlas of plant and animal histology. The nucleus is the characteristic structure of eukaryotic cells. It contains DNA and all the molecular machinery to produce ARN, by a process known as transcription. Typically, cells contain only one nucleus, but there are cells with more than one, such as osteoclasts, and some cells may contain many of them as the skeletal muscle fibers or the epithelium of some invertebrates. The shape of the nucleus is variable and is usually adapted to the morphology of the cell (Figure 1). Typically, the nucleus is rounded, but other forms are also found, as in neutrophils which contain multi-lobulated nucleus. The location of the nucleus is normally in the center of the cell, but it can also be found in more peripheral locations. For example, secretory cells have their nucleus situated in the basal part, and skeletal muscle cells have their nuclei close to plasma membrane. Figure 1. Different nuclear shapes. A. Epithelial cells from human gall bladder with rounded to elongated nuclei . B. Monocyte from blood smear showing a kidney-shaped nucleus. 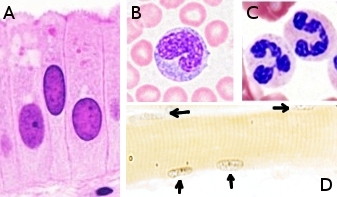 C. Neutrophils from blood smear containing a multi-lobulated nucleus. D. Longitudinal view of a skeletal muscle fiber with many nuclei, all of them located toward the periphery (arrows). Figure 2. The size and shape of the nucleus depends on the cell type, despite that nearly all the nuclei of an individual contain the same amount of DNA. 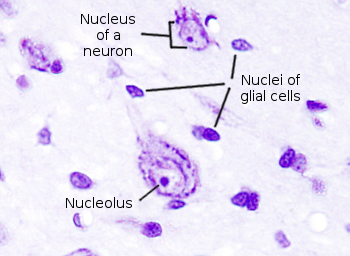 Neurons and glial cells are shown in this picture. Nuclei of neurons contain more loose chromatin, whereas glia nuclei have highly condensed chromatin, and therefore the size is much smaller. Although the amount of DNA is almost the same in the cell nuclei of an organism, the size of the nucleus is variable depending on the cell type (Figure 2). Furthermore, cells from species with different amount of DNA may show a similar nuclear size. These data indicate that the size of the nucleus is adapted to the size of the cell and to the cellular physiology, but does not depend closely on the amount of DNA. There are two nuclear compartments: nuclear envelope and nucleoplasm (Figure 3). 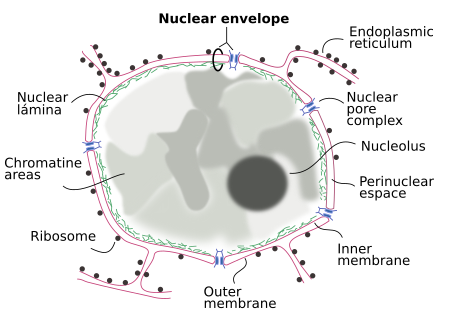 Nuclear envelope is the peripheral part of the nucleus that separates the interior of the nucleus, known as nucleoplasm, from the cytoplasm, and consists of an outer membranes, a inner membrane and a perinuclear spaces (between both membrames). Nucleoplasm-cytoplasm communication is regulated by the nuclear pore complexes, which are molecular scaffolds inserted in the nuclear envelope. The nuclear lamina is a layer of proteins lining the inner surface of the inner membrane of the nuclear envelope, which provide mechanical support to the nucleus. Figure 3. Components of the nucleus. In the nucleoplasm, DNA and associated proteins form the chromatin, which is referred as heterochromatin if it is highly condensed, or as euchromatin if it is loosely packaged. Decondensation of chromosomas after mitosis results in chromatin, and each chromosome decondensates in specific regions of the nucleoplasm. The nucleolus, a distinct chromatin domain, is also found in the nucleoplasm, as well as other dense structures known as nuclear bodies, which are composed of chromatin and other proteins. In this section of the atlas, we could go into all the molecular processes involved in DNA transcription and replication, as well as gene regulation. In the future, a new section may be opened to deal with these topics. For now, we will be focused in other features of the nuclear morphology and physiology, and encourage the reader to visit other excellent sites related to genetics. Edens LJ, White KH, Jevtic P, Li X, Levy DL. 2013. Nuclear size regulation: from single cells to development and disease. Trends in cell biology 23:151-159. Guo T, Fang Y. . 2014. Functional organization and dynamics of the cell nucleus. Frontiers in plant biology. vol 5. Artículo 378. doi: 10.3389/fpls.2014.00378 .